The TS 800 STIHL Cutquik® cut-off machine features a magnesium guard making the machine a full 0.7 pounds lighter than the previous model. 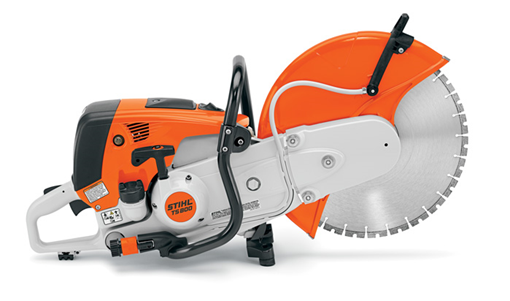 The TS 800 features a 16" cutting wheel, the largest size we offer in a handheld design. When used with the optional STIHL Cutquik® cart, the TS 800 is an excellent alternative to conventional walk behinds because it can be used as a handheld or quickly snapped into our cart for long, straight, controlled cuts. It's also fuel efficient, with enough power to cut through asphalt, concrete, rebar, iron and steel with ease. The TS 800 also features an ergonomic design and five-point advanced vibration control system built right into the handle, maximizing comfort so you can power through your day with less fatigue. When long, straight expansion joint cuts are needed, the optional cart, mounted water tank, guide wheel and depth gauge wheel make it easy to help keep the cut straight. With a cutting depth of up to 5.6", the TS 800 is a real pro performer whether in your hands or on the cart.